Perhaps you’re familiar with this scenario. 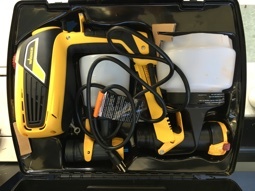 You’ve bought something new that comes with a storage case — an electric sander, for example, or a power drill. You take it out of the box, use it for a while, and then spend 20 minutes trying to remember how it was stored. Then, after struggling with several configurations, none of which let you close the lid, you either give up or find an alternate way to store you hardware. I feel your pain, and there’s a simple solution. Upon opening the storage box for the first time, before you touch a single thing, grab your favorite camera and snap a photo. Make sure you get a clear, focused, overhead shot that depicts exactly how everything is laid out at the factory. Next, print that image and place it inside the container. Done. I like to tape the image to the inside lid. Alternatively, you can put it in a zip-to-close bag inside the box, or store it in the app of your choice, like Evernote or even a special album in your favorite digital photo management app. That way, the reference you need is only a few taps away. This is a simple trick but it has saved me a lot of frustration and wasted time. Of course you needn’t stop at tools. Any multi-part piece of hardware — from toys to kitchen tools — can benefit. I use the same principle with my kitchen cabinets when I reorganize them as well. As above! I’m amazed I didn’t think of it myself! Oh that’s just silly. Brilliant, but silly. But mostly brilliant. Smart-Me makes plans for Frustrated-Me all the time, butI can see Frustrated-Me actually benefitting from this. This is one of those “Duh!” ideas that when I see it, I wonder why I didn’t think of it ages ago. Very smart and simple!